This is the second part in 5-episode series on travel through Pakistan by national highway N5. Our idea is to skip big cities enroute as most people already know about them. We will try to introduce lesser known small cities and towns of Pakistan here. Today we will pick up our journey just north of Rohri, cross the provincial boundary of Sindh-Punjab and travel a total distance of 361 kilometers to reach the city of Bahawalpur. Click on the map above to get a larger image of our route today. All the towns that are mentioned below are marked on the map as blue rectanlges. After leaving Rohri we drive another 32 kilometers on N5 before we reach the city of Pano Akil. Pano Akil is a tehsil of Sukkur District and as of 2006, Pano Akil city has an estimated population of 73000. It is most famous for the presence of a cantonment here as its construction was a bone of contention among nationalists in mid 80s. 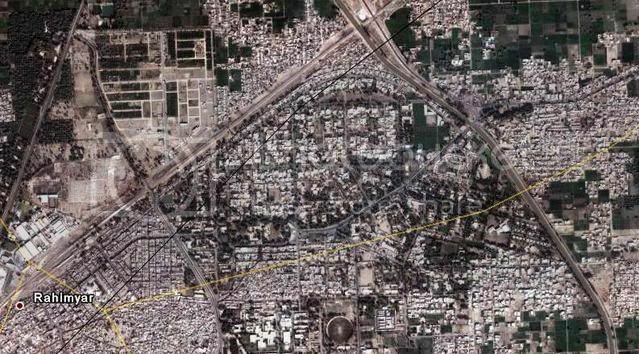 On the other hand the cantonment is strategically located owing to a big curve inward in International boundary. A quick look at the map can show the importance of this town. Pano Akil is served by Railways too. 28 km north of Pano Akil, N5 passes through the town of Ghotki. Nothing much to see here as far as tourism is concerned. 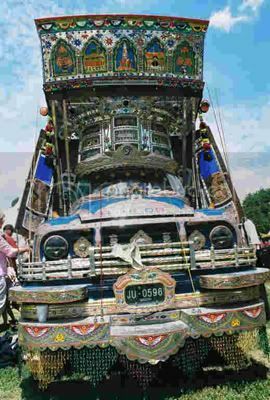 Ghotki however, is famous all over Pakistan because of a truck painter who originally hailed from here. His name is ‘Kafeel Bhai’ and he signed his paint work on frieght trucks as ‘Kafeel Bhai Ghotki walay’ (brother Kafeel from Ghotki). As the number of trucks painted by him increased on the roads, so did his popularity because he not only signed his name on trucks but also wrote an introduction to himself as an ambidextrous cricket player who could do both slow and fast bowling. As cricket is a national passion in Pakistan, Kafeel bhai’s name spread far and wide. His signatures included the sentence: ‘cricket ka be-taj badshah’ (uncrowned king of Cricket) and ‘Left-arm right-arm medium-slow bowler, kafeel bhai Ghotki’. It is said that overtime his fame crossed seven seas and a team of reporters arrived from Australia to see his ambidextrous bowling. His introduction at Wikipedia says that nowadays he?weaves cloth or nylon strings to make chairs in Ghotki. People who know him claim that he has reluctance accepting money from people and never demands money for his goods or services. People usually have to give it to him themselves. He often refuses to take the money in his hands and asks the buyer to just place it in his pocket. An Urdu sentence comes to my mind: ‘uff ye aajizi’ (oh this humbleness). Ghotki is served by Pakistan Railway. Estimated population of Ghotki town in 2006 is 64000. Mirpur Mathelo is famous for the presence of a Fauji Fertilizer Company (FFC) plant here. Established in 1978,?FFC plant?is the largest landmark in the city and is hard to miss while travelling by N5. The FFC plant also boasts of an outdoor wireless hotspot with a connectivity radius of 2 kilometers. The wireless coverage was installed here in 2005. Mirpur mathelo is served by Pakistan Railway. Estimated population of Mirpur mathelo in 2006 is 49000. As far as city markers are concenrned, Daharki is very similar to Mirpur Mathelo. So much so that it has a fertilizer plant just like Mirpur’s. 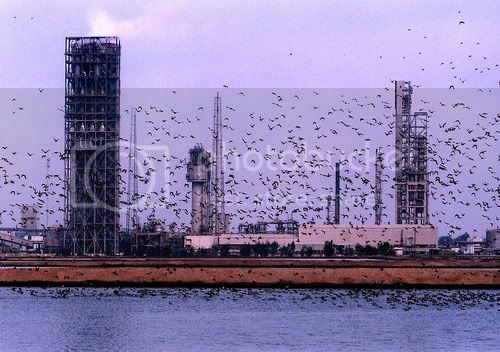 Daharki plant is owned by ECPL (Engro Chemical Pakistan Limited). ECPL has a very well maintained residential colony, located approximately 1200 meters away from the plant and next to highway N5. Daharki is also famous for a gas field located here. Gas was discovered here in 1957 at a depth of 2053 feet and the field was developed in 1965. This gas field however is used to supply gas to the Engro plant only. Daharki is served by Pakistan Railway. Estimated population of Daharki in 2006 is 41000. 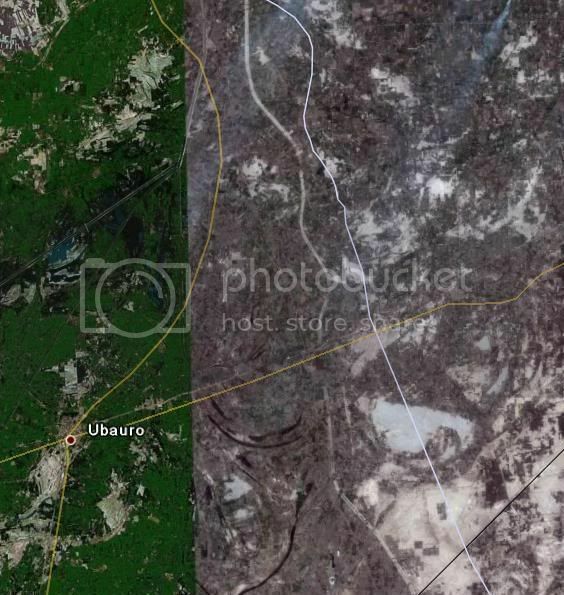 Look at the satellite image to the left. The slanted white line from top to bottom is the borderÂ line betweenÂ Sindh and Punjab. Kot Sabzal is the first town in Punjab province located on N5 after it enters from the province of Sindh. Expect your vehicle registration papers checked for inter provincial traffic by the Punjab police just south of Kot Sabzal. Kot Sabzal used to be a part of princely state of Bahawalpur. Rulers of Bahawalpur lost it to Mirs of Sindh in 1807. British under Sir Charles Napier restored the rule of Bahawalpur state on Kot Sabzal in 1847. If you pass Kot Sabzal on N5, it appears nothing more than few hundred village homes. Looking at it now it is hard to believe its eventful history under the rulers of Bahawalpur, Sindh and British. Sadiqabad is the first major city of Punjab on N5. As of 2006, it has an estimated population of 180000. Located almost on the border of Sindh and Punjab, Sadiqbabad is also a major hub of freight truck and inter-province bus services. N5 goes right through the town as by-pass for the city is not built yet. During my upcountry road trips from Karachi, Sadiqabad used to be the major milestone. My family always tried to reach Sadiqbad before sunset (637 km) and rest overnight in a road side motel before continuing journey northwards the next day. For us, reaching Sadiqbabad was also a psychological achievement as it showed that we had atleast travelled 1 province on our countrywide road trip. Sadiqabad is also served by Pakistan Railway. With a population of 300000 (estimated 2006), the city of Rahim Yar Khan is a major stop on highway N5. The city was part of the princely state of Bahawalpur. The city of Rahim Yar Khan dates back to 1875 when it was called Naushehra. It was founded by a person named Fazal Elahi Halani on the ruins of an ancient city called Pul-Wadda during Sumra supremacy period in Sindh. In 1881, the Railway authorities wanted to change the name of Naushehra as it was already a name of another city station near Peshawar called ‘Nowshera’. Consequently in order to avoid any confusion, Nawab Sadik Khan – IV of Bahawalpur state renamed the city after his first crown prince Rahim Yar Khan. Rahim Yar Khan is also famous because the former President of the UAE, Sheikh Zayed bin Sultan Al Nahayan had a residence built for him just outside the city, and is most referred to as his ‘Desert Palace’ by the locals. It is now owned by his son and successor Sheikh Khalifa bin Zayed Al Nahayan. Rahim Yar Khan is also served by Pakistan Railway. Most of the trains stop here. Rahim Yar Khan also boasts of an international airport with a 9300 ft long runway, called the Sheikh Zayed International. The airport was originally built for the exclusive use of Sheikh Zayed bin Sultan Al Nahayan. He later donated it to the government of Pakistan. Built in 1995, Rahim Yar Khan has a cricket stadium called ‘Mehmood Stadium’. The city also has a medical college called the Shaikh Zayed medical college. Tarinda is a very small town on N5 but I have mentioned it here because it forms a very important junction to Panjnad headworks. 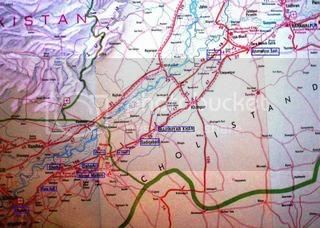 While N5 goes a little bit east towards Bahawalpur, another road from Tarinda continues northward and via Panjnad and Muzzafargarh forms an alternate route to Multan. Ahmedpur East was part of the now defunct princely state of Bahawalpur. Local name for this town is Ahmedpur Sharqia (eastern). As of 2006, it has an estimated population of 117000. After a recent realignment N5 bypasses the city. Bahawalpur (N5 kilometer marker 844) – Our friend Roshan Malik has already covered introduction of Bahawalpur City at ATP here. Therefore I will not go into details of Bahawalpur except it is Pakistan’s 13th largest city with a population of ~400000 according to 1998 census. KB :) bari der ki mehrbaan aate aate. I just noticed that now there is a whole page on wiki dedicated to Kot Sabzal. Take a look here. Thanks a ton!!!!! My sincerest apologies for the delay in reply.. A big big thank you fo your effort and for sharing the photo with us. My dad will not believe that it is the same town he was born in! :-) Once again thank you. A big Thank You for the reply :-).. Seriously, just to get some kind of word actually spurs us on.. bless you. Look forrward to hearing from you again. Thanks once again from my entire family.